Maybe you’ve heard the old saying, “The only thing needed to grow strong healthy grass is a crack in the sidewalk.” It may seem like this is true when grass or other vegetation invades an area where we don’t want it. But what about the opposite situation--when we want to establish a stand of desirable grass in an inhospitable setting? Can this be done successfully? In many cases, yes it can—let’s look at one such situation. In this “real life” situation, a gravel driveway was to be converted to asphalt. In order to save time and money, the old gravel and dirt mixture which was scraped off the surface in preparation for the asphalt paving was scooped up with a front-loader and deposited onto the grassy area beside the driveway. 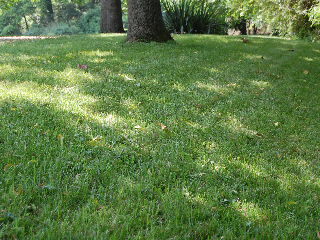 After spreading, a gravelly mixture about 2 inches thick covered the grass. Although it is slightly possible that some of the covered grass would have broken through the fill and survived, the odds were greatly against this happening. More likely, what would have happened is that random weeds would have invaded and created a very unsightly area bordering the newly paved asphalt driveway. Soooo….although the fill consisted mostly of small rocks approximately ½ inch in diameter, there was enough soil mixed in to give an optimistic gardener reason to believe that this wasteland could be converted to a beautiful green lawn space! Since this paving project was completed in the early fall, the perfect window for establishing a cool-season fescue lawn was just coming into play. After hand-raking around the edges of the fill so that the added mixture transitioned smoothly into the existing grassy area (thinking about ease of mowing when the new grass comes in), we used a broadcast spreader to add Kentucky 31 fescue grass seed and a generous amount of starter fertilizer. The next and final step was, I believe, the most important one—we topped it all off with a mulch of wheat straw. This not only helped prevent erosion of the existing soil from the rocky mixture, it also added precious organic matter to the nutrient-starved growing medium. Too, as the grass became big enough to mow, the grass clippings and the decaying straw added even more of an organic base into which the new grass could send its roots and, thus, begin to thrive. 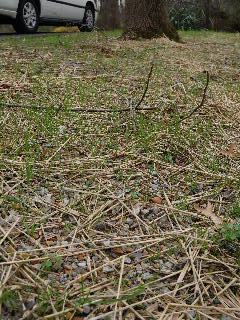 Although the small rocks within the mixture might have seemed like obstacles to the establishment of a stand of grass, in this situation I believe they were actually beneficial in helping hold the seeds in place as they established a foothold (the seeded area had a significant slope falling away from the pavement). The small rocks also shaded the soil, thus helping conserve moisture—in essence, acting as a mulch (though devoid of organic matter) in the same manner that the wheat straw acts as a mulch. The bottom-left photo was taken the following early summer as the grass was thickening and had already been mowed several times. So, even though you may not be able to establish a stand of grass in solid rock, you can grow grass in less-than-desirable situations. All you need is seed, fertilizer, patience, and a good layer of mulch!